Do you miss reading the newspaper? PressReader is an iPhone and iPad app from NewsPaper Direct Inc. that lets you buy and read daily newspapers from around the world in full PDF format. Think of it as a TiVo for newspapers. You can find and instantly download over 1,800 newspapers from 90 countries and 47 languages. The newspapers cost about 99 cents per issue, and there is also an option to subscribe to the newspapers of your choice to have them delivered to you automatically. When you get started with the PressReader app you get your first 7 issues for free, which is a great way to try out the features of the app. 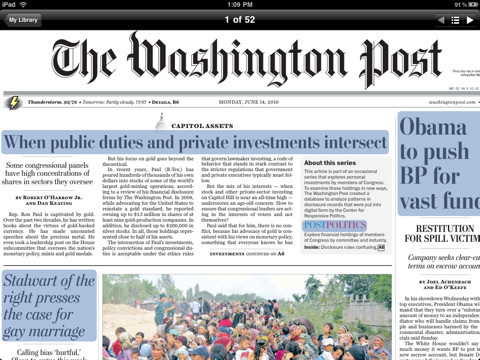 On the iPad the PressReader app is amazingly easy and natural to read. Once you open any newspaper issue, you are taken to the Front Page where you can flip to the right to read the additional pages and sections of the paper. Tap the outline button, to view the Sections menu. From here you can jump to any section in the newspaper by category like Sports, News, Opinion, World, Calendar, etc. You can read the paper in both portrait or landscape mode. Re-opening any paper loads it back to the page where you left off last time. Double tap on any section to zoom in and crisper fonts. The text of the PDF sharpens as you zoom in for better visibility. You can also pinch to zoom in/out. If you tap once on any page, sections in the text that are hyperlinks will change to a light blue background. Tap any headline to pop open a window where you’re able to view the full text of the article. From this screen, tap the headphone button to have PressReader, literally read you the text of the article. The on-demand audio in the app actually uses some network traffic to convert the text to speech on the fly, so you’ll need to be online for this to work. The voice of the female reader is surprisingly natural and human sounding. Tapping the from/to (ex [cont. A10] [from A1]) links navigate you back and forth in the paper. You can also tap email addresses to send authors feedback. The app has 4 tabs: 1) My Library where you have a list of all the publications you’ve purchased. Tap “Select Title” to browse papers by Country or by Language. Unfortunately United States is all the way on the bottom of the list, so you have to scroll down each time. Another great feature in PressReader is its ability to store you older newspapers. You can’t do text based searches on the content of your newspapers. All 3 accounts give you access to unlimited issues, although each plan offers various levels of back issue days, archived issues, offline storage, and monitoring alerts. Keep in mind you can always just pay $0.99 as you go for any issue using In-App Purchases on your iPhone or iPad. 2) Top Stories – lists an RSS feed reader style list of the headlines from various publications. Tap any headline to read the full story. You can also listen the audio file, although after you are done listening to the audio, there is no way to get back to the main story page. As a registered customer you have access to 2 articles from any issue within the past 7 days here. You can view the pdf screenshot of the newspaper the story was pulled from. The links and pages on this Top Stories section are a little buggy and sluggish to respond to your taps, and pages can freeze for moments at a time. It feels like the data is not well cached or the app’s feed section definitely needs to be updated with speed improvements. 3) Search – here is where you can find stories by keyword, and narrow them down by language and newspapers. The search results here again have the very slow to respond web based experience, like the Top Stories section. 4) Settings – this is where you enter your PressDisplay account information and authorize yourself for downloads after your 7 free issues have been completed. If you own an iPad, you really owe it to yourself to check out PressReader. I’ve shown this app to friends who have said they want to buy an iPad just to get this app. It’s just so natural and easy to use, and feels natural. It’s really as close as you can get to the printed version of newspapers, in a digital format, and the usability is well designed. Overall, PressReader is wonderful iPhone/iPad app with a powerfully simple and easy to use service plan the lets you buy and read newspapers on your device. The news feed portions of app are a little buggy at times will hopefully get stabilized in the next revision. The 99 cent pricing is very reasonable and a wonderful reading experience especially for iPad users. 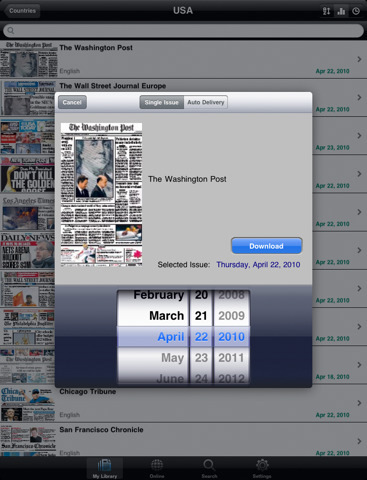 AppSafari review of PressReader was written by Joe Seifi on August 28th, 2010 and categorized under App Store, Featured, Feeds, iPad apps, News, Productivity, Reading, Universal. Page viewed 4577 times, 1 so far today. Need help on using these apps? Please read the Help Page.